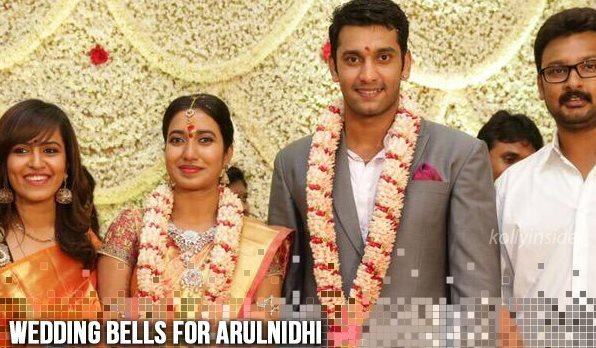 Arulnidhi of Vamsam and Mounaguru fame got engaged at a private function, held in the Chennai on Monday. Arulnidhi, Grandson of DMK supremo Karunanidhi, got engaged to Keerthana, daughter of retired Madras High Court Judge Kannadasan on 2nd of March in a star hotel in Chennai. The function was a private event attended by friends and family members. Arulnidhi who made his on screen debut through Pandiraj's Vamsam has acted in films like Udhayan, Mouna Guru, and Oru Kanniyum Moonu Kalavaanigalaum. His current projects are Demonte Colony directed by Ajay Gnanamuthu and Naalu Policum Nalla Irundha Ooorum. The happy actor took to microblogger to express his excitement, "Big day for me ... I'm engaged". The engagement function also saw his cousin Dhayanidhi Azhagiri and wife Anusha attending the function. The wedding is scheduled for the month of June but the date is yet to be fixed. Arulnidhi also reveals that it is an arranged wedding and not a love marriage as reported in certain sections of the media.